Modern décor tends to be in sync with the surrounding environment, especially those that define our cities. Houses decorated in modern style are particularly cherished for their comfort and glamour. 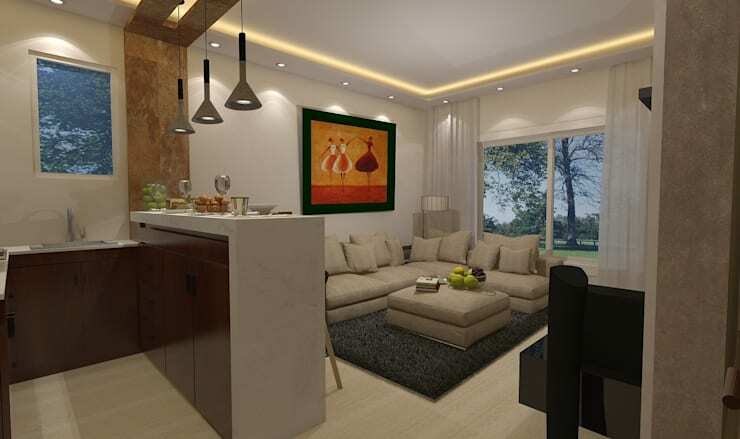 Today we are going to show you a spacious family home that is visualised in a modern style. Have a look. You will get some worthy ideas from its design. The living room of this Palm Hills apartment is located in one corner of a spacious drawing and dining area. It is decorated with a trendy sectional sofa, another preferred choice for modern homeowners, and a lightweight coffee table. The built in tv cabinet acts as a wall between the private and public spaces of the apartment. 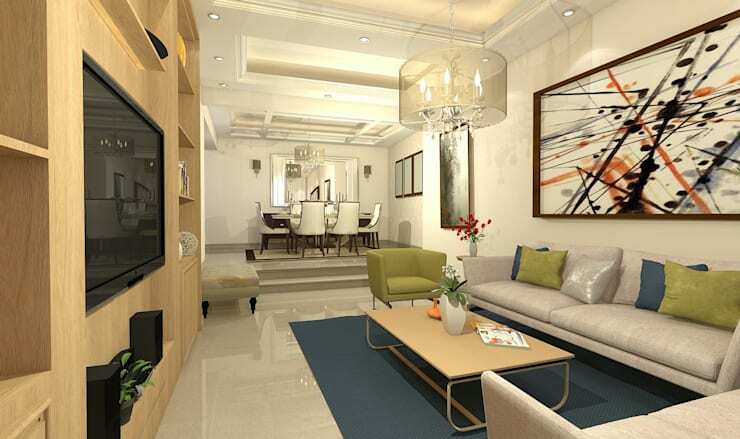 The living room is also decked up with interesting pendant lighting fixtures and large framed artworks. The interior designer has given a glamorous makeover to the reasonably sized bedroom. You can enjoy the actual planning of the project in the image above. It is furnished with a comfortable bed, slim tv cabinet and chic shelving systems. A combination of ambient lighting, ceiling mounted focus lighting and modern chandelier set the appropriate mood in this gorgeously decorated space. The earthly colour scheme provides a nice and comfortable backdrop and helps balance the glitterati. In line with the design of modern apartments, the entrance hallway is small. 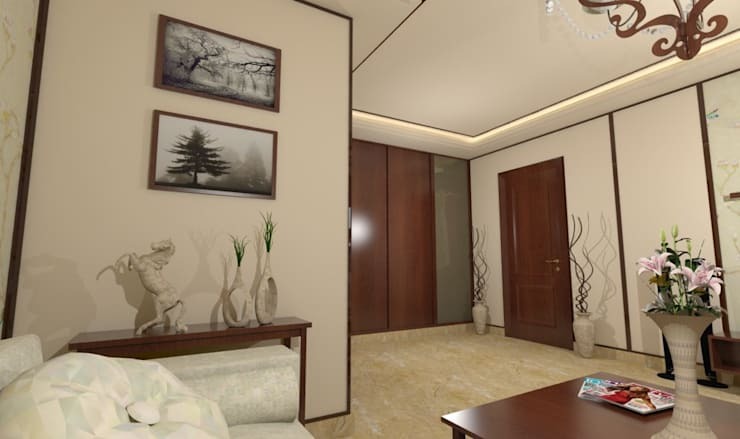 The guests can almost immediately access the living room after entering the apartment. The small hall, however, boasts of a tasteful décor. It is stylised with trendy pieces of artworks, framed images, flower vases and potted plants. 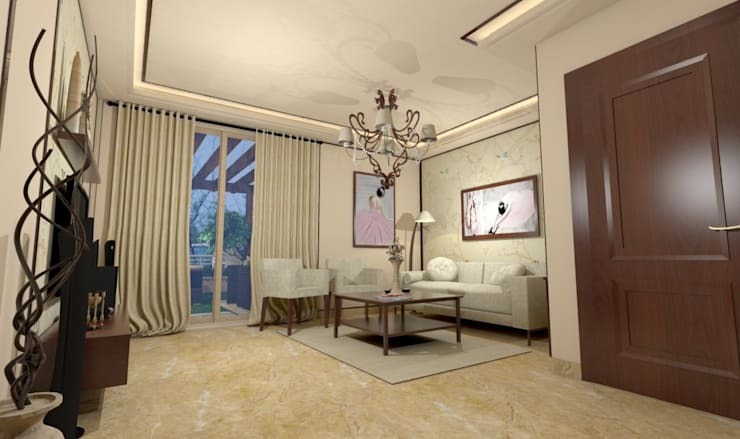 The warm tone of the flooring complements the colour scheme dominated by the shades of beige and brown. Check out the chic design of these small hallways. In this image, you can view a glimpse of the media room which also acts as a secondary living room. Due to the small nature of the room, it has been decorated with a select few pieces of furniture. Except for a sofa set and floating tv cabinet it does not boast of any other pieces of furniture. This space has a direct access to the greenery on the terrace just behind the sliding doors. Like other parts of the apartment, the interior is illuminated with an array of stylish lighting fixtures. Enjoy the full view of the simple tv cabinet. The floating cabinet does not waste any floor space. 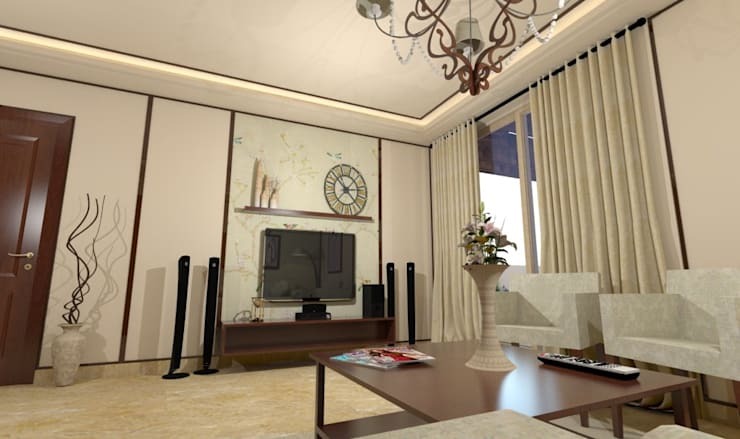 Consequently, the owners of the apartment can effectively manage clutter in the media room. Additional shelving system has been installed on the wall to maximise the storage space of this family home. The kitchen is relatively small in size. It is part of an open floor architecture that allows uninhibited flow of communication between the living room and the dining area. It is decked up with built in cabinets that are just perfect for modern kitchens of any size. Built in cabinets tend to keep the interior clean and uncluttered without compromising on the storage area. 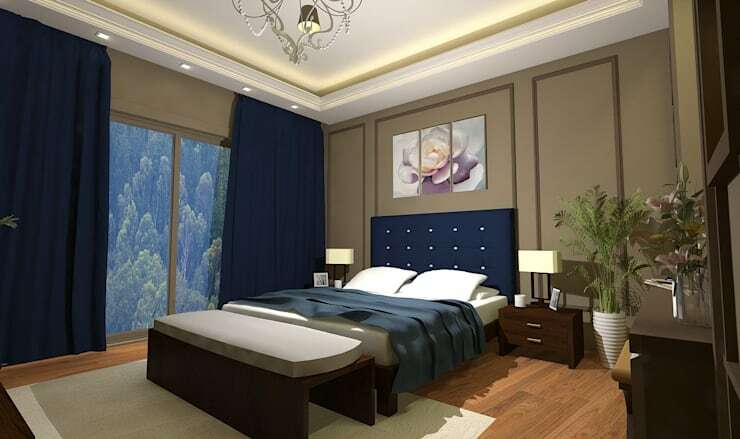 The secondary bedroom boasts of similar earthly colour scheme as the first one. The platform bed with upholstered headrest looks perfect for a peaceful night’s sleep after a hectic day. The room boasts of fine views of the surrounding landscape and beyond. 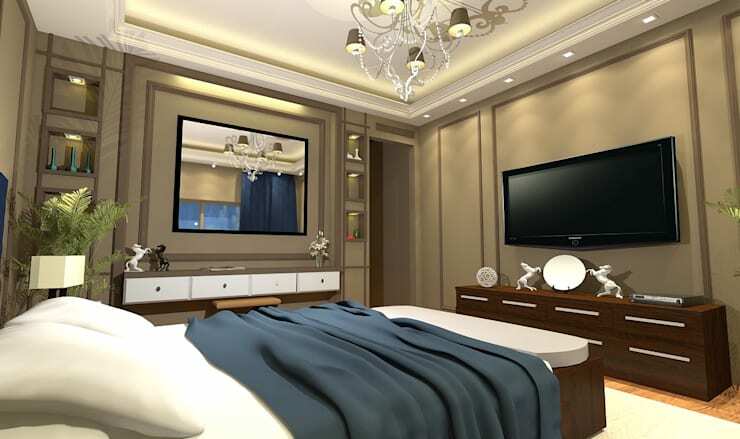 It is also decorated with a couple of modern nightstands with storage spaces and stylish bench at the foot of the bed. Several potted plants and charming lighting fixtures beautify the interior of this dreamy bedroom. Don’t miss out on this trendy city apartment perfect for a small family. Which particular feature of this apartment did you find most attractive?